Product market reforms are seen as a way to boost output in advanced economies, but we know little about their short-term impact. This column presents data from 18 advanced economies that reveal large differences in the potential upside of reform depending on the sector in which a firm operates, its size, and its financial health. Given the secular decline in productivity growth and the weakness of the economic recovery in many advanced economies, increased attention is being paid to the potential role of structural reforms as a way to restore economic growth. The weak economic recovery partly reflects a lack of aggregate demand, but the global financial crisis has also undermined aggregate supply, notably through its impact on investment. The current economic situation should also be seen in the context of the secular slowdown in productivity growth that started well before the beginning of the Global Crisis, and which suggests that deeper structural forces are also important (IMF 2015, OECD 2015). So policymakers hope that structural reforms can both promote potential output and boost aggregate demand by raising confidence (IMF 2016). While structural reforms can take many forms (e.g. banking supervision, property right laws and employment protection rules), advanced economies have focused particularly on product market reforms (OECD 2015). A lot of research has been done on the long-term benefits of competition-enhancing product market reforms (Boeri et al. 2015), relatively little is known about the short-term impacts of product market reforms across firms that differ in terms of the main sector in which they operate, the size of their operations, and their financial health. Understanding these effects may provide give us insights into how to design policy, the political economy of reforms, and the potential need for complementary policies. Our recent work provides a comprehensive analysis of the way these effects materialise over time, and how they differ across firms (Gal and Hijzen 2016). We used internationally comparable firm-level data across 18 advanced economies from 1998 to 2013, based on the Orbis database provided by Bureau van Dijk, an electronic publishing firm. We considered ten regulated industries in three broad sectors: network industries, retail trade and professional services. These sectors have different technological characteristics, market structure, and product market regulation. Together they account for about a quarter of non-farm private sector employment, and an even larger part if we take account of their role as inputs for production in other parts of the economy. To measure the restrictiveness of product market regulations, we make use of the OECD’s sector-level de jure product market regulation (PMR) indicators, complemented with an overview of major reforms based on a narrative approach (Duval et al. 2016). We document the short- to medium-term impact of product market reforms by estimating impulse-response functions for employment, capital and output using the local projection method (Jordà 2005, Teulings and Zubanov 2014). Short-term, firm-level effects of product market reforms are positive, and strengthen over time (Figure 1). The effects are immediate for both output and investment, and increase to 4% and 3%, respectively, after two years. The effects for employment are considerably smaller and materialise only after two years. These results control for key firm characteristics, reforms in the two preceding or subsequent years, and many unobserved factors through a rich dummy structure that controls for country-industry specific trends, sector-specific technological developments, and country-specific macroeconomic conditions. The last control is particularly important since product market reforms often take place when economic conditions are weak. The results are robust to various approaches to identifying major reforms and a number of other sensitivity checks. Notes: Solid lines represent impulse response functions based on the estimated coefficients; dashed lines represent 90% confidence intervals. See Gal and Hijzen (2016) for details. 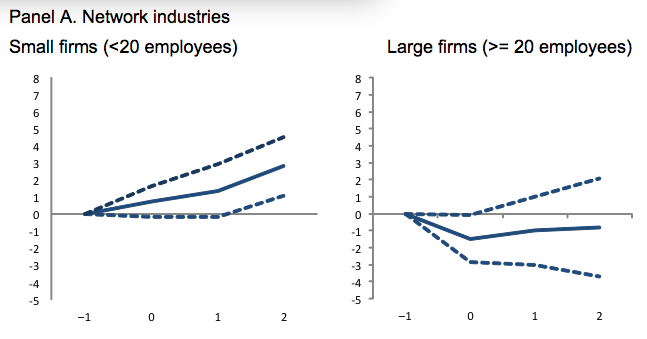 There are also systematic and plausible differences in the effects of reforms across firms of different size across different industries (Figure 2). More specifically, in network industries, small firms tend to benefit most from pro-competitive product market reforms, while larger ones downsize to reduce costs and maintain market share. 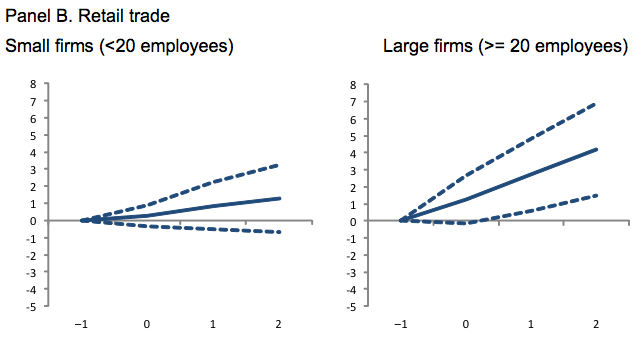 By contrast, in retail trade, large and potentially more efficient firms tend to benefit more from such reforms. These qualitative differences highlight important differences in the underlying mechanisms that create positive. These are due to differences in production technology, such as the degree of capital intensity and the nature of product market regulations. In particular, reforms in network industries aim for a simpler network access to potential service providers, thereby eroding the market power of established large firms. On the other hand, reforms in retail mostly concern easing restrictions on zoning and opening up additional plants, benefiting mainly larger, more productive businesses. Firms' financial difficulties weaken the short-term impact of product market reforms on investment (Figure 3). The short-term impact of product market reforms on investment among firms without any debt is about 7% after two years, whereas no effect is found with high debt-to-asset ratios. These findings highlight the importance of solving the problem of weak bank balance sheets when considering product market reforms. They also point to the complementary role of financial sector reform. This is particularly relevant in countries in which the flow of credit is still weak and the case for product market reform is relatively strong (Greece, Portugal and Spain, for example). Notes: Solid lines represent impulse response functions based on the estimated coefficients; dashed lines represent 90% confidence intervals. Some debt: strictly positive debt-to-asset ratio of less than 0.25; high debt: debt-to-asset ratio of 0.25 or more. See Gal and Hijzen (2016) for details. Deregulation yields positive spillovers on firms in downstream purchasing industries – both domestically and abroad – through input-output linkages. This is consistent with sector-level results by Barrone and Cingano (2011), Bourles et al. (2013), and OECD (2016). Our research confirms the positive effect of product market reforms on downstream firms through backward linkages within the same country using a potentially more credible identification strategy. It also provides some indication that these effects extend to firms abroad. So our work confirms the positive effects of pro-competitive product market reforms on economic performance in the medium to long term, while also providing rich new insights on the way the effects materialise. More specifically, these findings help to understand why it can be difficult to implement product market reforms in certain sectors, but less so in others. For example, it may be particularly difficult to implement product market reforms in network industries, since large incumbent firms have a tendency to lose jobs and profitability, while the opposite is true in retail. We did not investigate the tendency of credit constraints to mitigate the impact of product market reforms on investment, but the effects of product market reforms may materialise more slowly when credit is hard to find. These insights can be used to enhance the design of product market reforms and to motivate the need for complementary measures to promote aggregate demand, restore bank balance sheets and to alleviate the social cost of adjustment (IMF 2016, OECD 2016). Barone, G. and F. Cingano (2011), “Service Regulation and Growth: Evidence from OECD Countries,” The Economic Journal 121(555). Bassanini, A. (2015), “A Bitter Medicine? Short-term Employment Impact of Deregulation in Network Industries,” IZA Discussion Paper No. 9187. Boeri, T., P. Cahuc and A. Zylberberg (2015), “The Costs of Flexibility-Enhancing Structural Reforms: A Literature Review”, OECD Economics Department Working Papers, No. 1227. Bourlès, R., G. Cette, J. Lopez, J. Mairesse and G. Nicoletti (2013), "Do Product Market Regulations In Upstream Sectors Curb Productivity Growth? Panel Data Evidence for OECD Countries," The Review of Economics and Statistics 95(5): 1750-1768. (also appeared as OECD Economics Department Working Paper No. 1311). IMF (2015), World Economic Outlook, Chapter 3, April, Washington, DC. Jorda, O. (2005), "Estimation and Inference of Impulse Responses by Local Projections," American Economic Review 95(1): 161-182. OECD (2015), Economic Policy Reforms: Going for Growth, Paris. OECD (2016), "Short-term labour market effects of structural reforms: Pain before the gain? ", in OECD Employment Outlook 2016, Paris: OECD Publishing. Teulings, C. and N. Zubanov (2014), “Is Economic Recovery a Myth? Robust Estimation of Impulse Responses”, Journal of Applied Econometrics 29: 497-514.